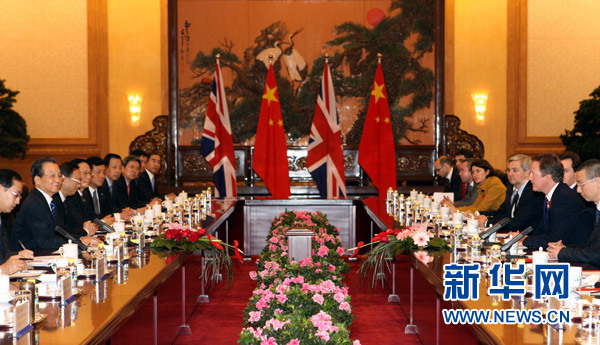 On November 9, 2010, Premier Wen Jiabao of the State Council held talks with Prime Minister David Cameron of the United Kingdom (UK) at the Great Hall of the People. Premier Wen said China and the UK are comprehensive strategic partners. The bilateral ties are multi-faceted. Against the backdrop of profound and complex changes in international situation, the two sides should strengthen political mutual trust and strategic mutual trust, maintain and promote the fundamental interest of both countries. Wen pointed out that the trade and economic cooperation between China and the UK achieved fruitful results and enjoys broad prospects. China welcomes the UK businesses to seize opportunities presented by China's industrial restructuring and the change of development modes, and to leverage their advantages in high-end manufacturing, aviation, aerospace, creative industries, financial services, energy saving, environmental protection and other fields to expand cooperation with China. Premier Wen expressed the hope that the British side could focus more attention on the central and western regions of China, where there are boundless opportunities for development. The UK should show greater boldness to relax restrictions on exporting high-tech products export to China, which is conducive to balanced and sustained growth of bilateral trade. Wen said the Chinese government encourages domestic enterprises to expand investment in the UK, which will add new vitality to economic and trade relations between the two countries. It was hoped that the British side could simplify examination and approval procedures and provide more targeted services to address the difficulty in obtaining visas by the Chinese people and other difficulties. Wen stressed China will earnestly fulfill the WTO commitments and expand the open market. China welcomes all businesses that meet the Chinese industrial policies. Any business that is registered and operates in accordance with the Chinese laws is regarded as a Chinese company and enjoys national treatment. China will unswervingly promote the protection of intellectual property rights. China's market environment will be more transparent, standardized, convenient and vigorous. Wen expected the two countries to continue to carry out a variety of initiatives and activities in areas such as education, culture, health, youth exchange, the Olympics to enhance mutual understanding and friendship between Chinese and British people. Cameron said that the UK values the comprehensive strategic partnership with China and firmly pursues the one China policy. The UK is willing to enhance exchanges and mutual trust on the basis of mutual respect and through important bilateral dialogue mechanisms. China's economic development is a strong engine driving world economic growth. The UK has always taken China's development as an opportunity. The UK hopes to establish the economic and trade partnership with China for common growth. The UK advocates recognizing China's full market economy status in the European Union. The two economies are highly complementary. The British side will take positive measures to take bilateral economic and trade cooperation to a higher level. The UK welcomes Chinese enterprises to expand investment in Britain and participate in infrastructure construction in the UK. The UK is willing to work together with China to strive for more positive outcome for the cultural and people-to-people exchanges between the two countries. The two leaders exchanged views on major regional and international issues and agreed that the two countries share broad common interests and shoulder important responsibilities in promoting world peace and development. The two countries will strengthen communication and collaboration in important international organizations and mechanisms such as the UN Security Council, the Group of 20, and the World Trade Organization so as to cope with various challenges more effectively. After the talks, the two leaders witnessed the signing of a series of bilateral cooperation documents. Wen also held talks with British entrepreneurs and briefed them on the development of the twelfth Five-Year Plan. He also answered questions and welcomed British entrepreneurs to expand cooperation with China. Before the talks, Premier Wen Jiabao held a welcome ceremony for Prime Minister David Cameron at the North Hall of the Great Hall of the People. Present at the welcome ceremony are Vice Chairman Niu Xiaoming of the Central Committee of the Revolutionary Committee of Chinese Kuomintang (RCCK Central Committee), Foreign Minister Yang Jiechi, Minister of the National Development and Reform Commission Zhang Ping, Minister of Finance Xie Xuren, Minister of Commerce Chen Deming, and Ambassador of China to the UK Liu Xiaoming.